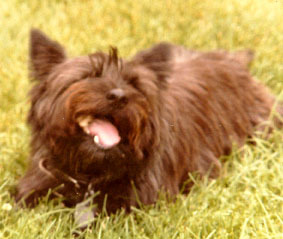 "In the whole history of the world, there is but one thing that money can not buy... to wit - the wag of a dog's tail"
Shamus was the Macika family dog from the late 70's until July, 1988. He's not nearly as vicious as he looks in this photo, unless there was a squeeky toy involved. He was a Carin Terrier. If that means nothing to you, think Toto in the Wizard of Oz.